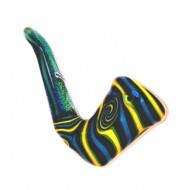 Larger hand pipe by Chameleon Glass. Blue and yellow swirls with black dhicro throughout. Doc..